In the past few weeks we saw Greece’s parliament adopt austerity measures demanded as conditionality by the IMF and Europe’s finance ministers in exchange for another round of Greek loans. So you’d think that the European sovereign debt crisis is under control, right? Wrong, two obvious reasons are the warnings issued by ratings agencies to the banks that are agreeing to roll over Greek government bonds into new investment instruments. S&P rating agency threat to declare default on Greek debt along with the suggestion from Moody’s rating agency that banks should have to take an impairment charge, could push the IMF and ECB back to square one. The euro can’t seem to catch a breath of air, as the next country to be hit is Portugal, when the rating agency moody’s downgraded the country’s debt to junk status. Moody’s claims that the move came as the country’s prospects had been damaged by the international efforts to rescue Greece from its sovereign debt crisis. The rating agency singled out the insistence of the EU leaders on private bondholders to take part in the Greek bail-out as a reason for the downgrade, putting Portuguese debt at Ba2. Adding that the country would like require a second bail-out before it could raise money in the capital markets. Moody’s also said that it had concerns that Portugal would not be able to achieve the budget deficit reduction targets that had been set by the EU and IMF. Budget deficit reductions being: reduce public spending, increase taxes achieving economic growth and supporting the banking system. The Moody’s downgrade of Portugal has led to a brutal sell off in Portuguese debt, which has seen Portuguese 10 year bond yields surge from 11.02% to 12.23%. Yields on Portuguese two-year notes soared 212 basis points to over 15.14 percent. There is increasing speculation that another downgrading of Ireland is imminent and Ireland’s 10 year yield has surged to over 12%. A less obvious, but a far more ominous entity lurking in the background is Italy. With precarious fiscal health, it could be the next to come under pressure. And with about $35 billion in loans to Italy and untold exposure to risk through murky derivative markets American banks are on the line. The spread between 10-year Italian bonds and Germany’s benchmark has reached a new record as investors worry the country may become engulfed in Europe’s debt crisis. The spread hit 300 points late Monday afternoon. The interest rate on a 10-year Italian bond was 5.67 percent while the rate on the German equivalent, considered the safest in the euro zone, traded at 2.81 percent. Further increases in interest rates could push the forecasts for Italy’s debt toward Greek levels. 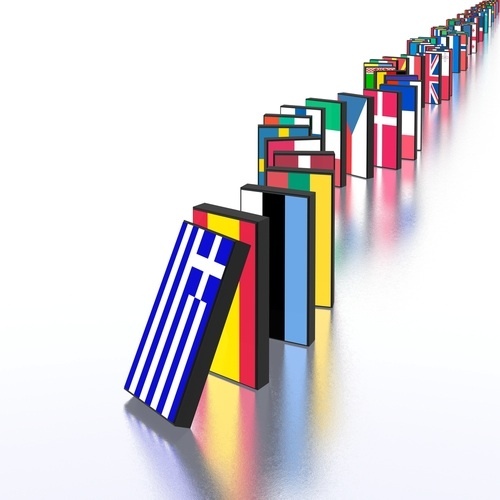 As European financial leaders yesterday bowed to the inevitable and conceded that Greece is likely to default on its massive debt, leaving private investors at a loss. Until recently the assumption among private investors had been that German and other northern European taxpayers would bailout failing governments in the euro zone countries, at least to the extent required to protect creditors against losses. This reason made some sense when it came to smaller nations like Greece which has about 360 billion in debt outstanding and potential credit losses in the 100 – 200 billion Euros range. These are small in comparison to the EU’s 12 trillion-euro economy. Italy, though, is Europe’s 3rd largest economy, 6 times the size of Greece’s economy, and with over 2 trillion Euros in debt, it’s unimaginable that Germany or the IMF could provide a rescue package to protect Italy’s creditors. Such a package would need to involve loans and guarantees of at least 500 billion to maybe even 1 trillion Euros to satisfy the markets. With a GDP of about 2.5 trillion-Euros and a debt-GDP ratio of 80 percent, Germany’s ability to take on more debt is very limited. The combined Germany’s GDP with the economic output of the Netherlands, Finland and Austria is about 3.5 trillion Euros, including France adds an additional 2 trillion, but France’s debt is already at about 85 percent compared to its GDP and only forecast to grow over the several years. And like a 19th century battalion holding the line against oncoming hoards with depleted firepower and an officer class at war with itself, the euro’s supporters are in a desperate situation. Once these facts dawn on investors, they are likely to demand higher yields on Italian government bonds. If Italy’s economic growth is disappointing or fiscal austerity measures fail satisfy the markets, Italian government debt will look even more dubious, this kind of volatility is hated by long term investors, and they will surely shift out of Italian assets. By itself that could lead to Italian rates rising, similar to what happened to Ireland, Greece and Portugal. Credit rating agencies have an unfair bias of power, with the downgrade of four notches to non-investment grade (junk) Ba2 from Baa1, there was absolutely no justification for this move or for moody’s rating agency to warn that Portugal may need a second bail-out, these actions did nothing but scare the markets. Last week a chorus of financial policy makers from Europe have accused moody’s downgrade of Portuguese debt as an act of financial vandalism, driving states into bankruptcy and destabilising the global system as a result. UN officer for world trade and development said that the agencies should be “dissolved” before they can do more damage, or at least banned from rating countries. Moody’s downgrade of Portuguese debt set off immediate contagion to Ireland, which itself was downgraded by rating agency on Tuesday, to Ba1 (junk) claiming the move was down to Ireland needing a second bailout. Dangerous ripple effects across southern Europe, with yields of Irish 2-year bonds surged to 242 basis points to 20.15 per cent and three-year yields jumped 244bp to 20.11 per cent. Just eight days ago, two-year yields were trading at 12.83 per cent, a jump of 8 % in under a week. Italy’s borrowing costs soared to their highest level in over a decade, amid volatile trading as market contagion from Greece. Although a relatively successful sale by the Italian treasury of €6.72 billion of 12-month bills – albeit at the highest yield for three years – calmed the markets. Some believe china had a hand in the success of the sale. So are the judgements of the credit rating agencies reliable? [In my opinion] No. One only needs to look at the dismal track records of the credit rating agencies to shake your confidence in their judgement. They were awarding an AAA credit rating to the Collateralized debt obligations right up until the collapse of the housing market in 2007-2008, and a little side note that the fact they were being paid by banks to award such high ratings to the junk bonds. And even in congressional hearings when the heads of the credit rating agencies were questioned about the ratings they expressed that they were “just opinions” and shouldn’t be relied upon. This instance shows that it’s all a racket, Iceland had an AAA rating up to 4 months before its collapse, because the government was doing exactly what the banks and ratings agencies wanted, that was allowing domestic financial institutions to rack up private debts of over 14 times the Gross domestic product. Now that Iceland has defaulted on their debt and kicked out the banks that brought it to its knees, the ratings agencies refuse to award an AAA rating to the country. Debt derivatives show that the low credit ratings are unwarranted, as credit default swaps on Iceland show that Spain is more likely to default than the small island state. Moody’s, S&P’s and Fitch are all unelected, unaccountable and have hugely inflated powers. The lifestyles of the people of Europe are being shaped by the board members and executives of rating agencies 2000 miles away. They exert an unfair balance of power over governments and their power should be curbed. Enter your email address to subscribe to trends report and receive notifications of new posts by email.